Here we are in the last minute countdown to Christmas, y’all! Are you ready? I’m getting there. Still have a few more things to shop for and a few more recipes to make, but I’m doing pretty good. Best of all – the grandkids are coming tomorrow!! We’ll pick them up after school and they’ll be here until January 2. Yay! That also gives their mom and dad a much needed little break with some quiet time to themselves. Continuing with my Christmas candy making – the next recipe up is Pecan Pralines. 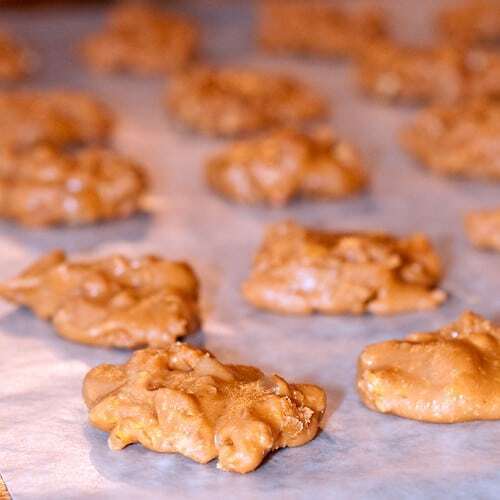 I think pralines are generally associated with the South and, according to online sources, they evolved from recipes brought to Louisiana by French settlers. The original French confection known as “praline” was individual almonds coated in caramelized sugar. New Orleans chefs substituted pecans for the almonds, added cream to thicken the candy and that became what is known throughout the South as pralines. Our pralines have a creamy consistency, similar to fudge. And, of course, there’s always the debate over whether the word is pronounced “pray-leen” or “prah-leen”. It’s pray-leens around here :-). Emphasis on the first syllable, please. With a little accent thrown in, too. Combine the sugar, buttermilk, corn syrup, baking soda and salt in a heavy bottomed, large saucepan. Cook the mixture, stirring constantly, over low heat until the sugar has dissolved. Continue cooking over low heat and stirring occasionally, until the mixture reaches 234 degrees on a candy thermometer (about 10 minutes). Stir in the nuts, butter and vanilla. Beat with a wooden spoon until mixture just begins to lose its shine. This will take anywhere from 4 to 6 minutes. Drop by spoonfuls onto wax paper. Let stand until completely cool and set. Combine the sugar, buttermilk, corn syrup, baking soda and salt in a heavy bottomed, large saucepan. Cook over low heat until the sugar has dissolved, stirring constantly. Continue cooking over low heat and stirring occasionally, until the mixture reaches 234 degrees on a candy thermometer (about 10 minutes). Stir in the nuts, butter and vanilla. Beat with a wooden spoon until mixture just begins to lose its shine (anywhere from 4 to 6 minutes). Let stand until completely cool and set. I definitely associate pralines with the south, along with most other delicious, indulgent, classic dishes :) How do you suggest toasting the nuts? I usually do mine on a non-stick skillet on low heat until they are golden, but I’ve heard some people do them in the oven. These look delish!!! Great idea to add to my holiday goodies! How fun to have the grandkids!! My oldest just got home from school last week and I am so happy to have him home – it really is what the holidays are all about! It’s a really good thing we don’t live closer Lana – otherwise I don’t think I’d ever make it out of your kitchen – these pralines look delicious!! Should be fine, Barbara. They might be slightly less rich tasting but still quite delicious. Yum! Do you take orders? Oh, Amy, I’m afraid I’d never get out of the kitchen if I started taking orders! These little things are very nearly addictive. wow these look so awesome! Southern favorite! I love pecan pralines. Living in Texas most of my life, they just seem like a staple to me! We love us some good Southern treats! Thanks for sharing the tasty pecan recipe. Your pecan pralines look delicious! I have never made pralines before, but I can see that I really need to correct this oversite. For Christmas I made 2 batches of pralines with evaporated milk, like I had always used, but then I did Lana’s and they were so good, that I ended up throwing out the others. These are the best I have ever tasted. Just be sure and use a big sauce pan. It bubbles up real good. Made another batch last week, better than the first. So glad you liked them, Barbara! I would chop the pecans first – then drizzle on some real maple syrup, stir and fry in a heavy pan until the liquid disappears. They would probably “candy-up” pretty good in a hot oven too ( but I’d watch them every second as it would only take a second for it to burn). Don’t mind me, I’ve been on a maple syrup kick – especially on sweet potatoes ! Hi! I just wanted to thank-you for a great recipe!!! I made these tonight and they are delicious! I think I over-chopped my pecans in the food processor, but the toasted flavor still came through. This is a wonderful recipe!!! You’re welcome, Sonya! So glad you enjoyed the recipe. No way is it “pray-leen”.. if you’re from Louisiana.. it is “Praw-leen” without exception.